The screen protector is excellent. Unfortunately we didn't notice that the tool we bought with the screen to help was for a S8 plus and didn't help at all. This has resulted in a slight misfit so that the top row of information on the screen is partially hidden. Rating would have been a five if the right screen fitting tool had been provided. It's strong but still easy to write with, wish I had spent more money on my screen protector the first time. Cd not type anything with this screen was on. Like all these so called strong glass protectors it cracked within 12 hours of fitting. The glass protector is brill. The fitting tool makes for easy application. I found fitting this screen protector easy but the finger prints are terrible. I have to constantly wipe the screen clear and it is continually covered in finger prints. Makes it hard to see in certain light. Protector has also scratched easy even though I've been very careful and protective of my new phone! Not impressed with this at all especially for the price! This screen protector is very easy to fit and comes with the usual cleaning cloths to make sure your phone screen is fully clean before fitting. However, upon dropping my phone from a small height, the screen 'protector' flew off and cracked. The protector had been on for a week so I thought maybe it had done it's job and had come loose in that time. I bought another, which again flew off and cracked in several places after just ONE DAY. I would understand if this product was cheap, or I had dropped my phone from a great height- but I only dropped it onto a table whilst standing. This product is a waste of money and I will be looking for a different type of screen protector from now on. Really easy to install, clear and almost unoticible.... Really durable...!!! Great fit with my spoken neo hybrid case. Very easy to fit with the supplied plastic jig. No loss of sensitivity. The screen protector is really easy to fit. The alignment tool makes the job simple. You can barely see the protector and screen sensitivity is as normal. Finger marks also seem to be minimal and if they do appear a quick wipe removes them. Great accessory for a smartphone. Fits very well with my case and doesn't lift away from the screen like the previous one I bought as a recommendation from a large mobile phone retailer I have only one reservation and that is when I want to swipe down from the top of the screen I have to press quite hard to get enough pressure and sometimes it takes several attempts. Other than that I'd thoroughly recommend it. With the frame this was pretty good and it actually saved my phone. When I dropped it it scattered and the screen remained undamaged. It is one of those sticking on the corner only but the best so far. It was a bit fiddly to get it positioned correctly but once that's done, it's great. Everything you need to fit it is included (screen cleaner, polishing cloth, dust remover etc) which is very useful. There's a very slight loss of sensitivity on the touch screen but you soon get used to it. Good quality pakaging and easy to apply but sensitivity is very poor in specific areas of the screen you have to apply firm pressure. A well made product. It's a bit fiddly to install but once done, is excellent. I am disappointed with how it affected the responsiveness of the screen. It makes it really difficult to use the screen, you really need to press it hard for it to work. Especially the centre parts of the screen. Typing is super annoying, I'll probably I'll be removing this protector soon. I would not recommend. so when I got this it looked great, however after it was applied it became very hard to type and use my touch screen. After only a few days of being in my pocket with nothing else the screen it has become scratched, not scuffed but actually scratched. when trying to get my screen to respond to my touch earlier today the screen protector actually cracked. Yes I now have a broken protector after trying to close an app on my phone. One star as it is still on the device and not fallen off, also fitting tool is amazing for getting an accurate fit. Quick delivery and no hassle. Great service! Quick delivery no hassle and got exactly what I wanted. I'll use these guys again! Fits S8 with gear4 protective case. The glass protective screen went on like a dream with the alignment tool supplied. Can't get it wrong. It's the best glass screen protector ever. It stays perfectly, it doesn't reduce the sensitivity it's perfect for the S8. Everywhere I looked it wasn't recommended as it comes out after few days and it reduces sensitivity but this one doesn't its perfect the best!! Hi everyone at mobile fun really pleased with the quality of the screen protector,looks good and easy to fit thanks ???? This screenprotector has only one issue that,it collects dust near the sides. The packing was quite good, and there was a QR code which allowed me to quickly watch a video on how to install the screen protector. The protector itself is high quality and definitely helps to keep the screen from being damaged (I especially need a good screen protector as I manage to break every screen on every phone I've ever had!). The protector goes around the edges slightly but not all the way. Also, I find that typing takes longer with the protector on, as screen sensitivity is noticeabley reduced (especially when swiping downwards from the top of the screen). To physically look at he phone, It isn't obvious the protector is on and it fits perfectly onto the screen of the phone with the Use of the handy installation tool. The screen protector being on my phone isn't an issue when I put it in my case (I have a few cases and the phone still fits with no problems). Overall a good product which does the job, but the only downside is that is definitely does decrease screen sensitivity and overall quickness of typing out messages, etc. The screen protector was easy to apply and hasn't changed the sensitivity of the screen. It is also easy to clean and goes well with the protector case. 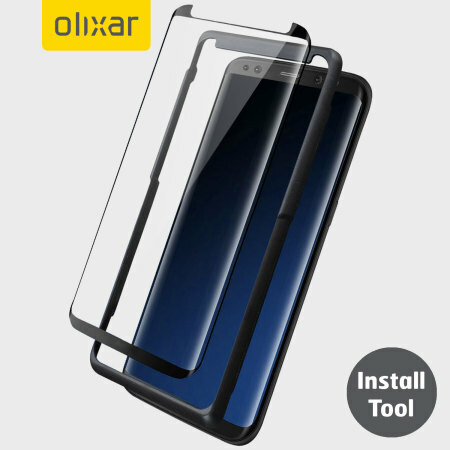 I first bought the Olixar case friendly screen protector back in July and within 2 days of fitting I was getting fine dust under the top left of the screen and the touch sensitivity was lacking. I ended up buying the same screen protector with the EasyFit guide and so far so good. No dust under the protector and the touch sensitivity is perfect. Very happy. You need to ensure the edges of the screen protector are carefully aligned and if they are off even slightly, this can greatly reduce sensitivity. I hope this helps. Not quite perfect, but pretty close. The product broke within 3 days of delivery. The glass protective screen developed a single crack originating from an obvious stress point at the very edge. The screen was installed using the alignment tool provided, paying meticulous attention to instructions provided by the on-line installation help video. Maybe I was just unlucky, maybe the product is generally good. I can only say what I find. It would be interesting to know if the production process has six sigma certification. Apart from the obvious disappointment, the screen was easy to fit and as close to being invisible without actually being so. The installation process was simple and easy. After using the protector I haven't noticed any loss of touch sensitivity. The protector also seems to be very case compatible. One downside is that after using it for a while some dust and dirt starts piling up under the curved part of the screen protector. This is disturbing if you are looking the screen closely or if the background in the screen is white. Glass screen protector enhances the beauty of the phone and is perfect fit. The application guide makes it an easy perfect install. This was a gift for my husband to protect his brand new S8. We were worried about the curved edges making it difficult to find a good fit. But this product is perfect. We bought it with the fitting too, and that, together with the video made it very simple to achieve a perfect fit. Once on, the protector is invisible, does not diminish the phone at all. Highly recommend it. It was easy to install if you you order the template with it . I read many reviews on other products and this one was one of the best . The touch screen works well with little or no lag. It's also case friendly. Im currently useing Neo hybrid and it fits well. You'll not be disappointed with this purchase.